Humans need their hands to hold and to operate hand tools and work pieces, to actuate steering, hand gears and handles, while handling hazardous materials and many other activities. Hands are the part of the body with the highest injury risk of all. Nearly 90% of all cut injuries concern the hand and arm system. Nearly all occupational groups are affected by the risk of arm and hand cuts. Examples are workstations at metal fabrication, handling in the food industry in particular butchery and the construction industry. 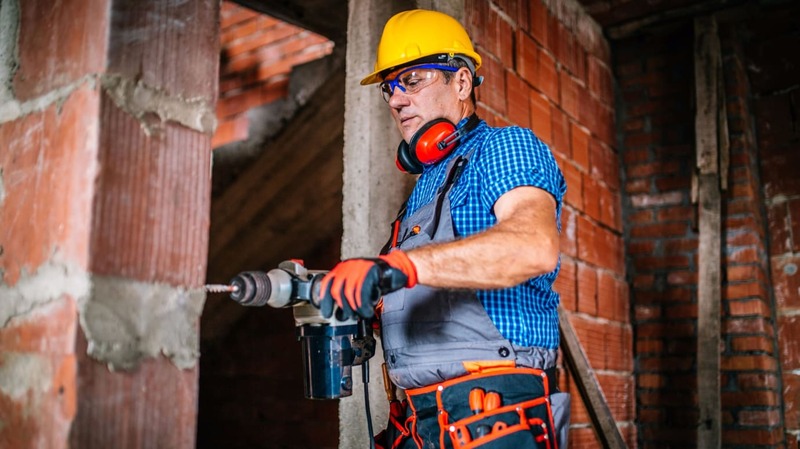 To reduce the risk of cut and puncture of hands and forearms it is necessary to take technical measures in the way tools perform in order to prevent injury. The following pictures show tools which prevents cuts. Picture 1 shows a knife with a blade that retracts automatically into the handle if there is no resistance, picture 2 shows a grinder for knifes in the food industry which can be used with one hand safely without the risk of the knife slipping, blades can also be covered, as shown in picture 3 for this safety carpet knife. The vast consumption of gloves in industry shows the special importance of this personal protection equipment. Gloves should protect the hands from mechanical, electrical, thermal, chemical, bacteriological and other risks and are made in different shapes, sizes and materials. When choosing gloves it is important to weight up the best protection and wearing comfort against dexterity and tactile quality. An always-present criteria for choosing gloves is the price, there are a lot of cheap products on the market which may not fulfil the required properties. European standards fulfil the general requirements of the EU-directive. Gloves which are proved and certified on the basis of European standards fulfil the directive. Gloves and arm protection, which should give protection against puncture wounds and cuts, have to comply to category II of the directive. This means that the products are proved and certified against the directive and the products are recognisable by their labelling; they are labelled with the CE-mark and a pictogram. "if protection against chemical hazards is needed in addition to the cuts protection it is necessary to use gloves which have been produced with a liner from knitted aramids coated with elastomers"
The choice of materials for arm and hand protection has to be appropriate to the risk and meet the requirements of the work place. Frequently a combined protection covering cut and puncture and protection against hazardous material (e.g. oil, grease, organic solvents) is required which results in a mixture of materials being used. Gloves made from chemical fibres have been used to protect from cuts successfully for many years. The materials are tough and have a good wearing comfort. Para aramid fibres are used for cut protection. In addition to the good mechanical properties the material has a high resistance against heat, especially if it is mixed with meta aramid fibres. The cut resistance is 5 to 6 times higher than that of leather. The advantage is, that the gloves normally have a very good tactfulness. Beside the use of para aramid as chemical fibres there are products made of a mixture of polyethylene fibres and polyamid fibres. The advantage of these products is that they are made from endless fibres which means they can be used in food or the IT industry, because the gloves won't emit particles. The drawback is that the material will melt easily and burn quickly. If protection against chemical hazards is needed in addition to the cuts protection it is necessary to use gloves which have been produced with a liner from knitted aramids coated with elastomers. These gloves could be produced in a way that they are proofed against liquids and widely resistant against oil, grease, acids, leach and organic solvents. The selection of the elastomere material has to be made painstakingly, since it has to protect against a particular chemical hazard it must be impermeable to the chemical ingredients. Statements concerning suitable materials are normally written in the EU safety data sheet for specific chemical products. If the user needs a good grip, especially if handling slippery or dirty material, he can use combinations made from chemical fibres and a layer of leather. "in accordance to the type of activity the employer is responsible to make a risk assessment. This risk analysis embraces the determination and the rating of the risks"
The highest protection against cuts with knives is offered by products made from stainless steel. The steel is knitted together in small rings creating a tough barrier when used as the material for gloves, most commonly used in the butchers industry. In addition to that area of application the gloves and arm protection can be used against the risk of animal bites. The combination of aramid fibres and an incorporated stainless steel core leads to gloves with a high cut resistance complete with essential wearing comfort. Besides the risk of cuts and punctures to the hand one can be hurt on the forearms too, a lot of gloves are produced with a longer turn up cuff to reduce risk. Each category II - protection glove has to be labelled. Along with the CE labelling the producer of the glove must also be recognisable. In most cases there will be a pictogram printed on the glove, the pictogram gives an indication of correct use for the glove, these elements have to be obviously visible on the product over its whole shelf life. Which gloves for which use? In accordance to the type of activity the employer is responsible to make a risk assessment. This risk analysis embraces the determination and the rating of the risks. After the risk assessment has been clarified, it is possible to establish what work protection is needed and on what scale it must be used. What risks take effect on the hands? What kind of protection has the glove to fulfil? What kind of wearing properties are desired? What kind of design and sizes are needed? What kind of maintenance and storage is needed? In the metal industry exists a huge number of different working places at which workers need an additional protection beside the protection against cuts. Additional risks are for example the impact of heat and drops of molten metal at welding workplaces, impact of potential allergic interacting products like cooling lubricants, epoxyresins in adhesives, polyurethans etc. In the glaziers handicraft cut and puncture protection is in the foreground. However there exist risks due to the use of UV-hardening adhesives (methylmethacrylates), putties and caustics. Beside the protection against cuts and punctures one has to take in count when choosing the glove material that the glass pieces should be handled also when they are moist and that they can be transported if the weather is humid without slipping. "to identify the correct glove the user should buy a glove which fulfils the PPE-directive"
In the butchers industry and butchers handicraft the workers use stainless steel knitted gloves, providing the highest guaranteed cut resistance combined with stitch resistance against knife punctures. The knife leading hand is usually protected with a cut resisting aramid-glove, it must be taken into account that the aramid glove doesn't protect against punctures. At construction sites there are a lot of activities done where abrasive material is handled, used materials are also sharp edged and workers have to be protected against cuts and punctures of a variety of materials including wires and nails. In addition to the protection against mechanical risks the workers are exposed to aggressive products like concrete, epoxy resins, polyurethans etc, the gloves must have a good protection against the aggressive materials but the cut resistance of the gloves can be less than the metal industry, normally gloves made with nitrile or butyle laminated cotton are sufficient. There are a lot of occupational groups which have to be protected against needle puncture injuries. The main groups are policemen and women, mail selectors (needles are often thrown away into post-boxes), hospitals staff. Up to now there exists no European or international standards that describes the proving of that kind of glove. There are currently only a few manufacturers of produce this kind of glove. Gloves, made from elastomers, are produced with several auxiliary materials. These materials are accelerators for the vulcanisation, stabilisers against UV-light and aging. Depending on the personal disposition of the wearer an allergic reaction may occur against one of the auxiliary material, if sensitive another elastomer glove with different auxiliary materials can usually be used. A number of variables have to be taken into account to achieve the right protection against cuts and punctures. The risk assessment should give answers for the level of required protection against the mechanical and chemical risks and in addition to that for the essential comfort. To identify the correct glove the user should buy a glove which fulfils the PPE-directive. Normally these gloves are recognisable by the correct labelling. In most cases one should use at least a category II product. This product is identifiable on the CE sign and a pictogram. If higher protection is needed a category II product should be choosen. This product has in addition to the CE sign and the pictogram a 4 digit number given which identifies the proving institute. ?